Stems slender, short-creeping, sparsely scaly; scales dark brown to black. Leaves clustered, to ca. 1 m. Petiole green or straw-colored to purple-black proximally or medium brown with age, 10--25(--45) cm, glabrous or sparingly scaly at base, glabrous at maturity. Blade lanceolate, broadly linear or oblanceolate, 1-pinnate, 25--50(--60) × 3--16 cm; rachis not winged. Pinnae often numerous, well separated, mostly green over winter, not decurrent on rachis, articulate to rachis, narrowly linear, simple, 1.5--9 cm × 1.5--5 mm; base rounded or auriculate and widened but not cordate; margins obscurely dentate, often appearing entire; apex short-acute to obtuse; pinnae glabrous or rarely with a few scattered hairs abaxially on costa. Veins free, forked. Sori broad, little blade tissue exposed abaxially. 2 n = 116. In crevices and pockets on oölitic limestone in rocky pinelands and infrequently on the edges of hammocks; 0--50 m; Fla.; West Indies in the Bahamas. A form with dissected, deeply or completely 1--2-pinnate pinnae occurs throughout the range of Pteris bahamensis and is known in the flora from southern Florida. Pteris bahamensis is often treated as a variety of P . longifolia Linnaeus, and some transition toward that species is evident. The primary differences are in the degree of rachis pubescence (denser in P . longifolia ) and in pinna base shape (typically cordate in P . longifolia ). The presence of transitional specimens and the quantitative nature of the differences suggest the taxa may be conspecific. Little is known, however, about the ranges and patterns of variation in both taxa. 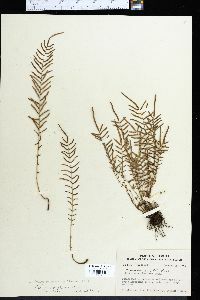 Pteris bahamensis is diploid and P . longifolia appears to be tetraploid. The two taxa are closely related, and further cytological and morphometric analyses will be needed before their relationships can be stated with confidence. Pteris bahamensis is maintained here at the species rank to emphasize the differences between the two taxa, though they are perhaps better treated as subspecies. 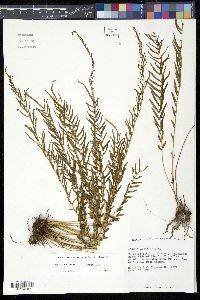 Specimens identified as P . longifolia from the flora are P . bahamensis . Pteris × delchampsii W. H. Wagner & Nauman is intermediate between Pteris bahamensis and P . vittata . Hybrid plants resemble a narrow, skeletonized form of P . vittata but have darker, shorter, and fewer stem scales, the petioles and rachises are less densely scaly, and pinnae are stiffer, farther apart, slender, and less ascending, with the margins less sharply dentate. The spores are largely misshapen. The chromosome number is 2 n = 116, with irregular pairing. Pteris × delchampsii is terrestrial or on rock in disturbed calcareous habitats on limestone walls and ledges in Broward, Dade, and Monroe counties, Florida; it is also thought to occur in Collier County, Florida. Outside the flora it occurs in the West Indies in the Bahamas. Plants of Pteris × delchampsii most often resemble one of the parent species, and this may confound identification. Hybrids can be distinguished by the high percentage of misshapen, collapsed, or empty spores and abortive sporangia.